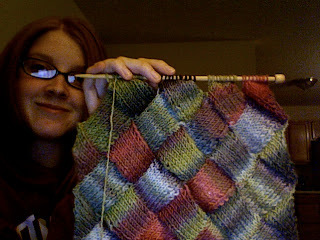 The Adventures of Cassie: Entrelac Scarf! First, today I started this little pretty, it is going to be a scarf eventually. It has been good knitting while I watch episodes of frontline on the PBS website. They have all of the past few years' episodes online! I'm loving how the yarn is working up as well. Yum! This is the yarn I was spinning from a few posts ago. It is single-ply light worsted weight yarn and I spun about 450 yards worth of it. The scarf is great! I love the colours!